The Dell XPS13 L322X Ultrabook is a truly wonderful development machine. With a third generation dual core Intel i7 processor and fast SSD disk, you literally hold a Linux mini-server in the palm of your hands. This Ultrabook, originally imaged by Dell with Windows 8, was configured with dual-boot Debian 7.0 Wheezy and CentOS 6.3 - the best of both Open Source Linux variants. You get a WARNING that the script has not been tested on your distro, and "If you wish to run this script anyway run with FORCE=yes". Most folks simply give up at this point, or start coloring between the lines with a supported O/S. But knowing that Ubuntu is an offspring of Debian gives us a fighting chance to change platforms. Install apache2 (version 2.2.22-13) if you don't already have it running. Install python and python-dev (both versions 2.6 and 2.7 are loaded on this system, default comes up at ver 2.7.3 on the python command line). OpenStack will install lots of python dependencies later. Install screen. I am most concerned with the proper deployment of the mysql server because the keystone bug caused the most pain in the installation and necessitated some reboots to clear hanging processes (unstack.sh and even killing processes manually will not do if you're stopped at creating the database and users). Every time the stack.sh script hangs, you will need to start from scratch. Create a user stack with group stack and home directory in /opt/stack, give sudo perms to user stack. This is the default, you may be able to change it to suit your needs. #    echo "WARNING: this script has not been tested on $DISTRO"
#        die $LINENO "If you wish to run this script anyway run with FORCE=yes"
# Should cinder perform secure deletion of volumes? A logical volume group named "stack-volumes" (derived from the formerly nova-volumes VG of the nova component of OpenStack) should be created on an empty physical volume. Since I had no free space to spare and the XPS13 was set up previously with 16G of swap space, I carved out an 8G disk partition of type 8e00 (Linux LVM), created a PV on /dev/sda7 to receive the stack-volumes VG and rebuilt swap on the remaining 8G on /dev/sda8. This required immediate coordination with the CentOS half that resides on the Ultrabook, because swap is mounted by either at boot time and the swap device name in /etc/fstab changed. Alternately, you may be able to create the LVM volume group on an USB stick (just remember to plug it in before you need it). Obviously, 8G is very skimpy for OpenStack VMs, but there are tiny machine images you may run as a developer. Most all of the pre-requisites needed in Ubuntu which the script will load have a corresponding package in Debian. I found one notable exception: open-iscsi-utils is not available (the iscsiadm command is included in the open-iscsi package on Debian). Comment out this package name in devstack/files/apts/n-cpu before you run stack.sh, or you will get stuck with an unmet dependency. In regards to the specified eth0 interface, while the XPS13 Ultrabook does not have an ethernet port, a USB dongle (the StarTech.com USB 3.0 to Gigabit Ethernet NIC 10/100/1000 Network Adapter, USB to RJ45 from Amazon.com) with a locally-compiled Asix ax88179_178a.ko kernel module was installed to connect to the network. You are now finally ready to run stack.sh as root in Debian. The script will change environments to the stack user created earlier (remember, the account must have sudo perms for the script to execute properly) and will run in a screen session. When properly finished, you will get a summary of accounts and URLs. stack.sh completed in 190 seconds. OpenStack services will be running after the script completed. Connecting to http://localhost/ with a web browser should present the OpenStack Dashboard login screen. If you believe the folks at OpenStack.org, you only have two options to try OpenStack: 1) Public Clouds and and 2) Local Dev Environment: devstack.org, which was done as described above. Looking at what we have installed with the DevStack script, it appears that a lot of the stuff is temporary (i.e., look in /usr/local/bin - you have nova, but there is no nova Debian package properly installed on the system). What I mean is, the install will only live in its present form until you run the next stack.sh script. So if you try to customize anything in the config files of the various components, it will be overwritten by the script when you run it again for any reason. This implies you can either modify the script to your liking, or try to load all .deb packages from a proper Debian-supported repository and install them on the system. As a sysadmin, I prefer the latter approach, as I like to receive weekly updates on packages and stay current with the latest releases on the system. There is a third approach: build your own cloud. In past endeavors, I have built OpenNebula from source on Debian sparc just to see if it can be done, but it is not as popular as OpenStack, so we'll stick with mainstream Open Source technology that has a growing rate of adoption and lots of heavyweight sponsors. Also download and install the repository key with apt-key add, then apt-get update. * Dashboard ("Horizon") provides a modular web-based user interface for all OpenStack services. * Network ("Quantum") provides network connectivity as a service between interface devices managed by other OpenStack services. * Compute ("Nova") provides virtual servers upon demand. * Image ("Glance") provides a catalog and repository for virtual disk images. * Object Store ("Swift") stores and retrieves files. * Block Storage ("Cinder") provides persistent block storage to guest VMs. 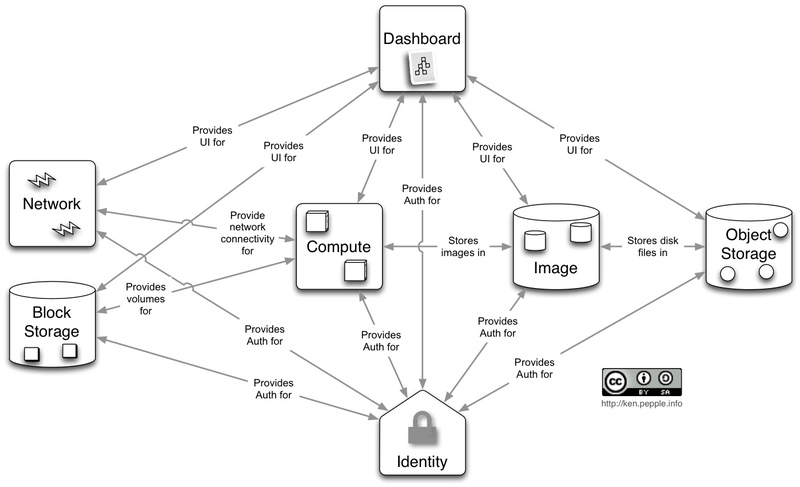 * Identity ("Keystone") provides authentication and authorization for all OpenStack services. Let's start with OpenStack Compute, codenamed Nova. An apt-get install nova-common (containing elements that are needed in all parts of Nova) will bring in the following new packages for Folsom besides nova-common: dbconfig-common nova-compute-kvm python-crypto python-daemon python-glance python-nova python-novaclient python-prettytable. The nova-common package configure will present a screen for database setup. Select NO - the package can be configured later on by running "dpkg-reconfigure -plow nova-common". We already have files /etc/nova/api-paste.ini and policy.json from DevStack, so you can view the differences before you install the maintainer's version. Best is to make a backup of api-paste.ini and policy.json, then install the maintainer's version. You can later edit the files and add the missing credentials, IPs, etc. to the new versions. The reason is, the config files that come with the package may list other options, and give some clues about what's deprecated in the version you installed. With the new repo for Grizzly enabled, the dependency list is much longer, and the nova-common, nova-compute and python-nova packages from Folsom will also be upgraded. Unfortunately, this is where you run into problems. The package nova-common from Grizzly will not configure properly at post-install (throws a python ConfigObjError). I presume it's caused by a versioning mismatch, but tracing it involves lots of work. You get the same python error with cinder-common. I found references to bug #1110567 nova-common dpkg --configure broken in Ubuntu. So, after loading some other components that behave (i.e., keystone, glance, novnc), and even some of the toys that come pre-installed in the XPS13 Ubuntu developer edition (juju, juju-jitsu, lxc, zookeeper, apt-cacher-ng, bzr, mr, byobu, debootstrap, gource, graphviz, tmux, vagrant, virtualbox), I disabled the Grizzly repo and reloaded stable Debian package versions for Nova. A note about virtualbox: I had installed the Oracle distribution previously, so vboxdrv was already available for the kernel, and this created a conflict. Because of dependency requirements, I had to purge the Oracle package and reinstall the Debian version instead. DKMS then built and configured a new set of modules for the running kernel. I continue to run the Oracle version of virtualbox only on the CentOS half of the machine. This illustrates exactly why I'm trying to build a custom DevStack using Debian packages. I purged all Folsom Nova packages and started from scratch with the Grizzly repo. Ran into the same python problem - downloaded the nova-2013.1~g3 source package, examining the config files, and working on a fix. Checked on Debian Bug #700620: nova-common: fails to upgrade from sid: configobj.ConfigObjError: Parsing failed with several errors. After building the python package, it will install in /usr/local/lib/python2.7/dist-packages/ (anything stored in /usr/local is a custom path, containing files that were not loaded from an official Debian repo). You can see here how many packages you need to install if you want to build OpenStack. Will tinker with this some more and post updates when available. Everything seems to work, with the exception of building the virtualbox kernel modules (Bug #696011), which fails in make with 'VM_RESERVED' undeclared. Old version is 4.1.18-dfsg-2+deb7u1 from sid. Upgraded all virtualbox packages to version 4.1.18-dfsg-2.1 from experimental, which now build and load the vbox modules with the new 3.8 kernel. I was especially worried about Bug #689268: Intel HD 4000 (Ivy Bridge) graphics freeze. Not happening so far - worked with the GUI for several hours while away in a meeting, and the XPS13 Ultrabook behaved nicely. The screen brightness keyboard control and the Cypress trackpad have the same old issues, though. The good news is, the gplhost Grizzly repo now contains several package updates, which have started to come in (i.e., python-novaclient ver 2.12.0). This made it possible to install the nova ver 2013.1-1 packages without any python errors. Of course, you have the problem of /etc/nova being overwritten by the Debian packages, so make sure you keep a copy of the files generated by DevStack and the new config files. The way to check that you have everything is 1) see what packages are missing when comparing the new distribution with older releases, 2) compare corresponding package files in /usr/bin with the DevStack files installed by the script in /usr/local/bin, and 3) search for documented changes. Regarding the missing cinder-rtstool, it was either renamed to rtstool, or removed, as indicated here. Note: after corresponding with Thomas Goirand, it was a nice surprise to receive the first Grizzly package update coming in from the gplhost.com repo - cinder ver 2013.1-1 is now complete! Filed Debian Bug repport #704751 nova-consoleauth 2013.1-1 conflicts with nova-console 2013.1-1. Also filed Debian Bug report #704757 novnc 0.4+dfsg+1-6 conflicts with websockify 0.3.0-1. In his response, Thomas Goirand (zigo) states that websockify is *not* in Debian yet (it is in the FTP master NEW queue), and he will fix the novnc package in the gplhost.com repository. Very good! I will have to go through the config files and create permanent nova, cinder and glance configurations to keep on the system.